OXFORD, Miss. 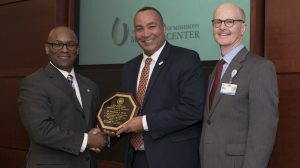 – Faculty members at the University of Mississippi and the university’s Medical Center have been honored with diversity awards by the board of trustees of Mississippi Institutions of Higher Learning. RoSusan Bartee, professor of leadership and counselor education, and Dr. Leandro Mena, professor and chair of population health science, were recognized at the IHL’s Excellence in Diversity Awards ceremony Feb. 15 in Jackson. Dr. Helen Beatrice Barnes, a retired UMMC physician and administrator, also was awarded the Karen Cummins Community Service Award. Each was presented a plaque by Shane Hooper, IHL trustee and chair of the Diversity Committee. Bartee said she is humbled by her recognition. “I recognize that I am just one member of a much larger community of very passionate people in our health center who collectively are doing an amazing work promoting inclusiveness and equity not only in our health center but throughout our state,” he said. 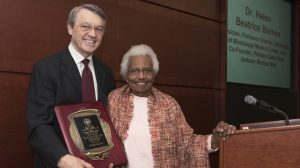 Barnes, professor emerita of the UM School of Medicine and co-founder of the Primary Care Clinic at the Jackson Medical Mall Thad Cochran Center, was honored for her longtime commitment to improving the health and lives of Mississippi women. After joining the UMMC faculty as an assistant professor of medicine in 1969, Barnes served as professor and chair of the Department of Obstetrics and Gynecology until her retirement in 2003. After that, her vision and passion to provide comprehensive health care for women led to the founding of the Primary Care Clinic for Women at the Medical Mall, which became the primary clinical site for the National Center for Excellence in Women’s Health at UMMC. The board voted last year to name the community service award in memory of trustee Karen Cummins in recognition that her life epitomized what the award is all about, helping to improve Mississippi’s communities with a welcoming and inclusive spirit. The IHL honors enhance the university’s ongoing efforts to promote diversity, said Katrina Caldwell, UM vice chancellor for diversity and community engagement. “The IHL Excellence in Diversity Award is special because it celebrates the often-invisible labor of faculty and staff in our community who are deeply dedicated to helping us honor our stated commitment to diversity, equity and inclusion on our campuses,” she said. Each IHL member institution, as well as UMMC and Mississippi State University Division of Agricultural, Forestry and Veterinary Medicine, submitted one nomination for consideration to the board’s Diversity Committee. Nominees were evaluated based on positive contributions to the campus and the state and advancing diversity among their respective institutions. Bartee became the first African-American to receive tenure and promotion to professor in the Department of Leadership and Counselor Education at Ole Miss. She is listed in Top 40/Under 40 in Mississippi, Who’s Who in Black Mississippi, Who’s Who Among Executives and Professionals and Who’s Who in America. A School of Education researcher of the year, Bartee previously served as program coordinator for the master’s, specialist and doctoral programs in educational leadership. She utilizes every opportunity to champion equality and equal rights. “My commitment to diversity simply mirrors my commitment to humankind,” Bartee said. “Human beings are our greatest resource, yet most underutilized asset. Associate professor of medicine with the Division of Infectious Diseases, Mena graduated from the Universidad Nacional Pedro Henriquez Urena in Santo Domingo, Dominican Republic, and from Tulane University School of Public Health and Tropical Medicine in New Orleans. He is director of the Center for HIV/AIDS Research, Education and Policy for the Myrlie Evers-Williams Institute for the Elimination of Health Disparities. Mena served 14 years as the medical director of Crossroads Clinic, the only publicly funded exclusive STD/HIV clinic in the state, and co-founded Open Arms Healthcare Center, a community-based clinic that offers primary care services with an emphasis in health care needs for LGBT populations in Jackson. He has more than 26 years of experience in clinical and epidemiological research in the area of sexually transmitted infections, including HIV, with special interest in the dynamics of transmission and the role that social determinants of health play in perpetuating these epidemics in sexual and gender minority populations. 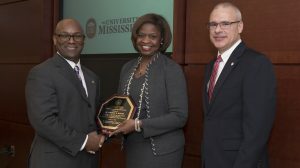 For more information on diversity and inclusion efforts at UM, go to http://diversity.olemiss.edu/. For more information about the IHL, contact Caron Blanton at cblanton@mississippi.edu.